Keno is an ancient Chinese game that has since become a popular numbers game. The basic idea of the game is that 20 random numbers will be drawn from a selection of 1 to 80 to form a winning result. Prevision Keno takes it one level higher by creating a variety of exciting bet types from these 20 numbers. 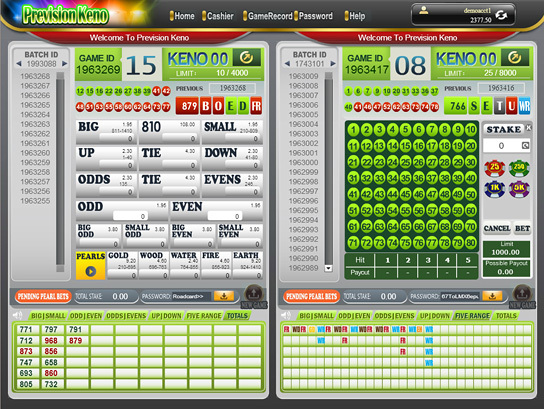 The unique feature in Prevision Keno is that it allows players to simultaneously bet on 2 different tables, plus the result is not bound by any delays in the official site, along with a speedy payout system and a pre-generated road card for extra security, Prevision Keno is a definite choice for a fair, transparent and safer game. Payout: 420 is smaller than 810, therefore all bets on "Small" win. Odd: From the 20 numbers drawn, more than ten numbers are odd numbers. Even: From the 20 numbers drawn, more than ten numbers are even numbers. Tie: From the 20 numbers drawn, there are exactly ten odd numbers and ten even numbers. Up: From the 20 numbers drawn, more than ten numbers ranged from 1 - 40. Down: From the 20 numbers drawn, more than ten numbers ranged from 41 - 80. Tie: From the 20 numbers drawn, there is exactly ten numbers ranged from 1 - 40 and ten numbers ranged from 41 – 80. Payout: There are more numbers that range from 1 – 40, therefore all bets on "UP" win. In Pearl Ball, the player can choose to bet between 1 to 5 numbers from the range of 1 – 80. The payout is different depending on the number of hits against the 20 numbers drawn. Payout: The total 840 is greater than 810 and it is an even number, therefore all bets on "Big/Even" win. Note: If the total sum of 20 numbers drawn is equal to 810, all bets on "Big/Odd", "Small/Odd", "Big/Even" and "Small/Even" will be refunded.